Just when you were running out of reasons to steal office supplies, this piece of wooden awesomeness comes along. Forget those double clothespin rubber band guns. When that annoyingly immature co-worker starts a rubber band war, break out this beast. 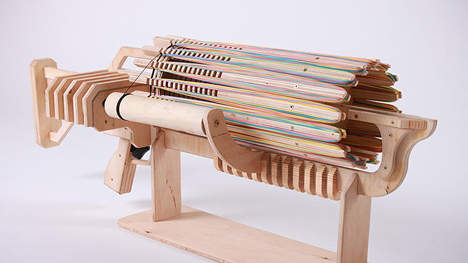 This toy Gatling gun fires a ridiculous 672 bands per minute! 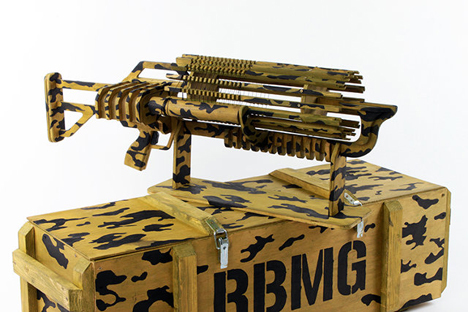 Imported, not surprisingly, from the same region that gave the world the AK-47, it’s a Ukrainian product dubbed the Rubber Band Machine Gun. Created by design student Alexander Shpetniy at the National University of Lugansky, it features 16 barrels powered by five AA batteries. Also not surprising is that it quickly surpassed its Kickstarter campaign goal of $5,000, nearly reaching the $100,000 mark. It will have a relatively modest $95 price tag and be available in standard, black, burnt wood and camouflage – because guerrilla warfare is key to winning an office ground war.